The Dymo stands for "Dynamic MOI," and the STR8-Fit technology is an adjustable fitting system that gives you eight different clubface lie angles. One of the coolest things about the club is the high MOI and the "PowerBow." This rear "PowerBow" gets thicker as the loft increases. Thus, more mass is shifted back and towards the heel side, giving the driver an added draw bias as the loft goes up. What's more is the higher lofts have a shallower face height, a more closed face angle, and a more upright lie angle. These all help you square the clubface at impact. The thing I like best is the STR8-Fit adjustable fitting system. It works like this: the shaft adapter and hosel tilt 2 degrees off axis which leads to eight possible lie angles. Nike tests show that eight different settings produce up to 45 yard of directional difference. This is like having eight drivers in one. It's pretty easy to adjust as well. It comes with a wrench; just make sure you read the manual carefully and you will have no problems adjusting to your preference. If you tend to slice, simply adjust the face into one of three closed positions. Also, you can always bring the club into a pro shop and have a pro help you adjust it. 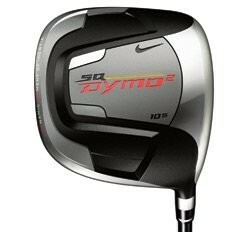 The other two drivers I like more are the TaylorMade Lady R9 Supertri Driver and the Nike Lady SQ Machspeed STR8-Fit Driver. Both of these clubs are a little more money, but with good reason. I like the Machspeed better than the Dymo because of the more aggressive square shape. And the Supertri is my all-time favorite because it gives you more adjustable variance and combines an aerodynamic clubhead with an adjustable clubface.